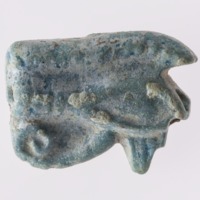 This small, crescent shaped amulet was excavated in an Iron Age II room in a domestic building at Megiddo. 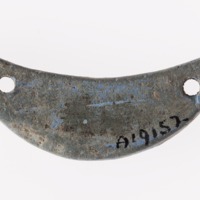 The two holes at either end of the crescent suggest it would have hung from a cord or chain and been worn by its owner. The moon had always been important in ancient Near Eastern religion, but between the ninth and sixth centuries BCE it gained even greater popularity through the Aramean cult of the moon god Sin and the increasing popularity of astral cults across the ancient Near East. The moon was connected with agriculture and fertility and played an important part in religious festivals, including in Israel (see, for example, 1 Samuel 20:5, 24; Isaiah 1:13-14; Hosea 2:13; Ezekiel 45:17; 46:1, 3; Psalm 81:3). The crescent moon was celebrated as a symbol of redemption, as the small crescent moon rose from the days of darkness that form part of the lunar cycle. Although some texts in the Bible associate the moon with Yahwistic religious activity in a legitimate way (for example, Ezekiel 46), others polemicize against the astral worship that became popular in Judah in the seventh century BCE (Deuteronomy 4:19; 17:3; Jeremiah 8:2; 2 Kings 23:5). 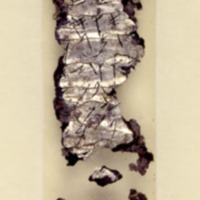 Jeremiah 8:1 announces judgement upon the “inhabitants of Jerusalem” for having worshipped the sun, moon, and the host of heaven, while 2 Kings 23:5 says that the kings of Judah had appointed special priests to make offerings to the sun, moon, stars, and constellations in the high places around Jerusalem. Both Jeremiah and 2 Kings associate astral worship, including worship of the moon, with the upper echelons of Jerusalemite society, accusing even the kings of engaging in these activities. Although the difference between “legitimate” (Psalm 81:3; 1 Samuel 20; Ezekiel 46) and “non-legitimate” (Deuteronomy 17:3; Jeremiah 8:1-2; 2 Kings 23:5) ritual practices involving the moon is unclear, the moon had a longstanding and important place in Israelite and ancient Near Eastern religious beliefs, at both official and popular levels.